Before you begin tweaking your derailleur hanger back into position, first make sure that the hanger is actually the source of your shifting problems. 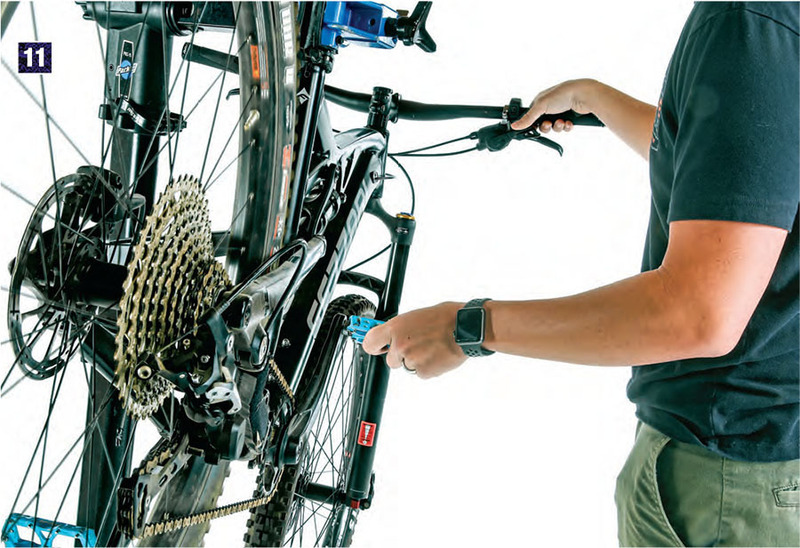 Start by checking that your rear derailleur is set up properly, paying close attention to your B-tension screw and ensuring that your cables have proper tension. With modern 1x drivetrains, the upper pulleys on derailleurs don’t have as much axial play, allowing for quicker shifting but requiring more fine-tuning. If those adjustments don’t fix your problem, it’s more than likely you have a bent derailleur hanger. For this repair you will need a Derailleur Hanger Alignment Gauge such as the DAG-2.2 from Park Tool. Any good local bike shop should have a tool similar to this, but if you like to do your own repairs, this tool will cost you $75. That said, it might make sense to share this tool among your riding buddies. Whether the damage happened during a crash or a shuttle ride, this is the tool that can fix the problem. The first step when straightening a hanger is to remove the derailleur from the hanger. It can be helpful to take photos with your cellphone to ensure the rear-derailleur is reattached in the correct position. The hanger is designed to be pliable enough to bend during a crash, preventing damage to more expensive parts. It is imperative that the thru-axle is as tight as it is when riding. 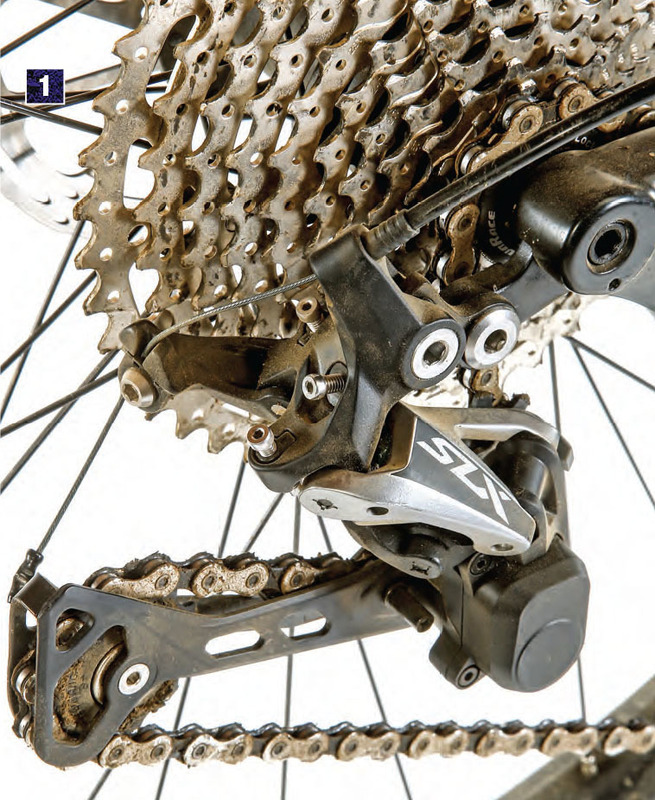 Never assume that a brand-new bike or brand-new derailleur hanger is perfectly aligned by default. Sometimes the alignment will have been overlooked during the bike’s assembly or damaged during shipment. Screw the tool’s threaded tip into the rear derailleur hanger’s mounting hole. If you have some grease handy, put a little on the threads. Be sure to not over-tighten the tool, as this will damage the threads. Any plane requires at least three points of reference to be verified. The alignment tool can be adjusted to check three points from its position. This is why the bracket support slides vertically, as well as in and out, to accommodate different wheel sizes and hub spacings. Position the tool (as shown in the photo) and slide the indicator until it is about 1mm from the outside edge of the rim. Rotate the tool 180 degrees and make sure that the indicator is the same distance from the rim as it was before. If your wheel is not perfectly true, you should check the same point of the rim in order to avoid any misreading. To make it easier, you can refer to the valve stem. If the difference between these two readings is less than 3–4mm, you may want to leave your hanger untouched and move on to the next step. Realigning your derailleur hanger is a delicate operation. Be careful when pulling or pushing on the tool and make sure to use as little force as possible. The goal is to just to get it back to its original form without stressing the material. This will minimize any weakening of the hanger. If you are worried that the hanger’s integrity has been compromised, it’s best to purchase a new one. Check that the tip of the indicator is approximately the same distance from the rim as you work your way around the wheel. Check at least three positions. Push or pull on the tool until the alignment is as close as possible for all three points of reference. The more practice you have with this task, the easier it will become. Reinstall your rear derailleur, paying attention to its bracket stop and how it mounts on the hanger. Refer to your cellphone photos from Step 3 if needed. Next, make sure to not over-torque the rear derailleur, as this could misalign the hanger again. Keep in mind that the your derailleur’s high- and low-limit screws will likely need to be readjusted as well as the cable tension.